Restoring previously drained wetlands is a strategy currently being used to improve water quality and decrease nutrient loading into Upper Klamath Lake, Oregon. In this 2003–05 study, ground- and surface-water quality and hydrologic conditions were characterized in the Wood River Wetland. Nitrogen and phosphorus levels, primarily as dissolved organic nitrogen and ammonium (NH4) and soluble reactive phosphorus (SRP), were high in surface waters. Dissolved organic carbon concentrations also were elevated in surface water, with median concentrations of 44 and 99 milligrams of carbon per liter (mg-C/L) in the North and South Units of the Wood River Wetland, respectively, reaching a maximum of 270 mg-C/L in the South Unit in late autumn. Artesian well water produced NH4 and SRP concentrations of about 6,000 micrograms per liter (µg/L), and concentrations of 36,500 µg-N/L NH4 and 4,110 µg-P/L SRP in one 26–28 ft deep piezometer well. Despite the high ammonium concentrations, the nitrate levels were moderate to low in wetland surface and ground waters. The surface-water concentrations of NH4 and SRP increased in spring and summer, outpacing those for chloride (a conservative tracer), indicative of evapoconcentration. In-situ chamber experiments conducted in June and August 2005 indicated a positive flux of NH4 and SRP from the wetland sediments. Potential sources of NH4 and SRP include diffusion of nutrients from decomposed peat, decomposing aquatic vegetation, or upwelling ground water. In addition to these inputs, evapoconcentration raised surface-water solute concentrations to exceedingly high values by the end of summer. The increase was most pronounced in the South Unit, where specific conductance reached 2,500 μS/cm and median concentrations of total nitrogen and total phosphorus reached 18,000–36,500 µg-N/L and about 18,000–26,000 µg-P/L, respectively. Water-column SRP and total phosphorus levels decreased during autumn and winter following inputs of irrigation water and precipitation, which have lower nutrient concentrations. The SRP concentrations, however, decreased faster than the dilution rate alone, possibly due to precipitation of phosphorus with iron, manganese, or calcium. The high concentrations of dissolved nitrogen and phosphorus during the growing season give rise to a rich plant community in the wetland consisting of emergent and submergent macrophytes and algae including phytoplankton and benthic and epiphytic algae that have pronounced effects on dissolved oxygen (DO) and pH. Midday readings of surface-water DO during summer often were supersaturated (as much as 310 percent saturation) with elevated pH (as much as 9.2 units), indicative of high rates of photosynthesis. Minimum DO concentrations in the shallow ground-water piezometer wells were 0.4 mg/L in the North Unit and 0.8 mg/L in the South Unit during summer, which is probably low enough to support microbial denitrification. Denitrification was confirmed during in-situ experiments conducted at the sediment-water interface, but rates were low due to low background nitrate (NO3). Nevertheless, denitrification (and plant uptake) likely contribute to low nitrate levels. Another possible cause of low nitrate levels is dissimilatory nitrate reduction to ammonia (DNRA), a microbial process that converts and decreases nitrate to ammonia. DNRA explains the excess ammonia production measured in the chambers treated with nitrate. Surface-water levels and standing surface-water volume in the Wood River Wetland reached a maximum in early spring, inundating 80–90 percent of the wetland. Surface-water levels and standing volume then declined reaching a minimum in August through November, when the South Unit was only 10 percent inundated and the North Unit was nearly dry. The shallow ground-water levels followed a trend similar to surface-water levels and indicated a strong upward gradient. A monthly water budget was developed individually for the North and South Units of the Wood River Wetland and then summed to produce a budget over 2 water years (2004 and 2005). Inflows for the entire wetland consisted of precipitation (43 percent), regional ground-water discharge (40 percent), applied water for irrigation from adjacent surface-water bodies (12 percent), ground-water seepage through dikes (4 percent), and discharge from artesian wells (1 percent). Outflows consisted of open-water evaporation (64 percent) and evapotranspiration from emergent vegetation (36 percent). Outflows exceeded inflows by about 22 percent over the 2-year period. Changes in surface- and ground-water storage during this period amounted to losses of 1 and 2 percent relative to the total inflow, respectively. A water-budget residual consisting of the errors in measurement of all water-budget components and the sum of any unaccounted for components indicated a deficit of water of 19 percent relative to the total inflow. The monthly patterns in water-budget residuals closely resembled the pattern expected for soil-moisture storage, which was not estimated, but indicated that soil moisture could represent a significant part of the water budget for the wetland. The distribution of inflow between the North and South Units generally was proportional to their area, with the primary exception being applied irrigation water, which entered entirely into the North Unit. Because of the larger area of open water in the South Unit, the proportion of the outflow from open-water evaporation was greater than from the North Unit. 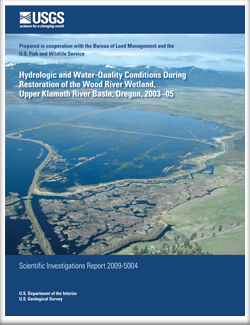 Carpenter, K.D., Snyder, D.T., Duff, J.H., Triska, F.J., Lee, K.K., Avanzino, R.J., and Sobieszczyk, Steven, 2009, Hydrologic and water-quality conditions during restoration of the Wood River Wetland, upper Klamath River basin, Oregon, 2003–05: U.S. Geological Survey Scientific Investigations Report 2009-5004, 66 p.